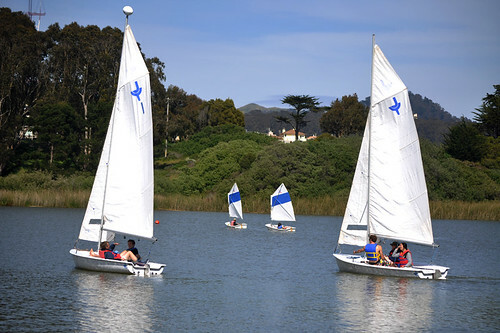 Unbeknownst to many students at San Francisco State, the Recreation, Parks, and Tourism department offers a sailing class that meets on Lake Merced during the last four Fridays of the Spring semester. The class has been offered since the 1970s, but was downgraded from a semester-long three-unit class to a one-unit class two years ago thanks to budget cuts. Chair of the Recreation, Parks, and Tourism department, Patrick Tierney, says the class is very popular for GE units. Although, “most people take it not so much for the units…I think they take it because they want to take it,” said Tierney. 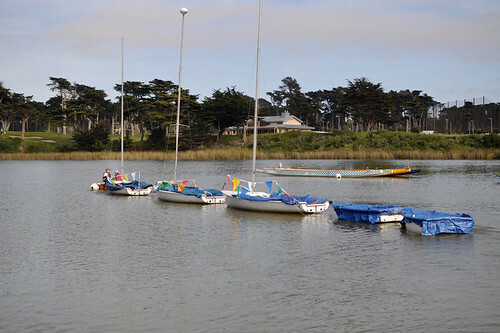 Professor McCreary and Adrianna Iantorno bring sailboats from the boathouse to the dock at Harding Park in Lake Merced so students can set sail. 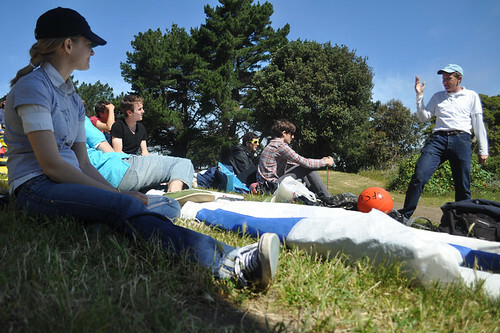 Aimee Walden sits in the shade of a tree and listens to professor Robert McCreary's sailing lecture. 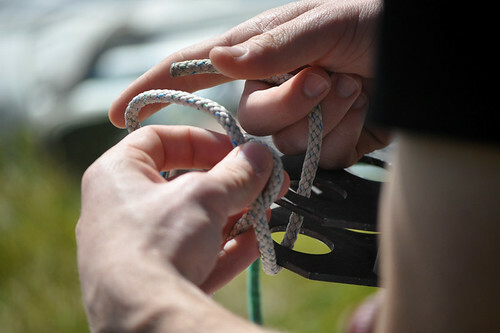 Freshman Anthony Burt practices tying a knot to prepare for sailing Lake Merced. 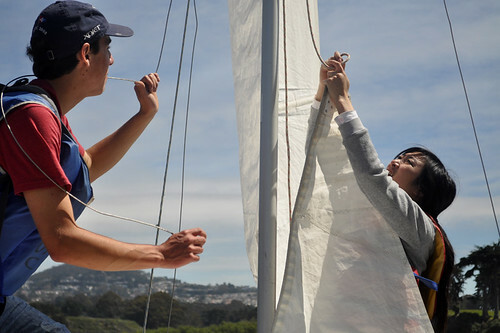 Sailing assistant Dash Johnson helps Jacqueline Co rig a sail on April 19. The sailboats had to be assembled before setting out. 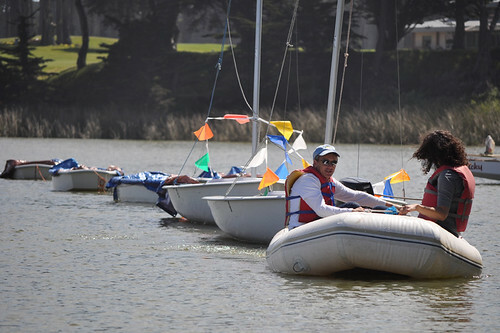 Students sail Lake Merced on April 16. The class uses two types of sailboats, larger three person boats with two sails and single person boats. 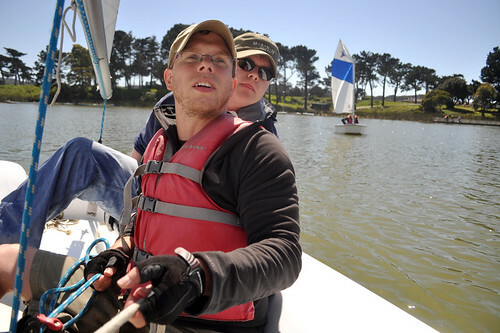 Jamieson Prevoznak, foreground, and Kyle Day sail Lake Merced on April 16. Each had only sailed once before. 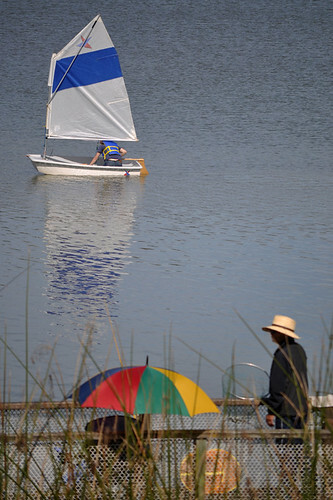 Jamie Hamel sails past a fisherman on Lake Merced. 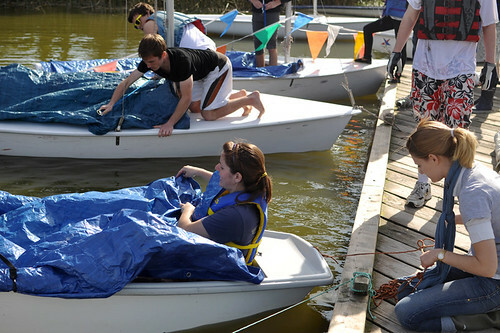 After a full day of sailing, students cover boats in tarp so they can be stored in a boathouse at Lake Merced. 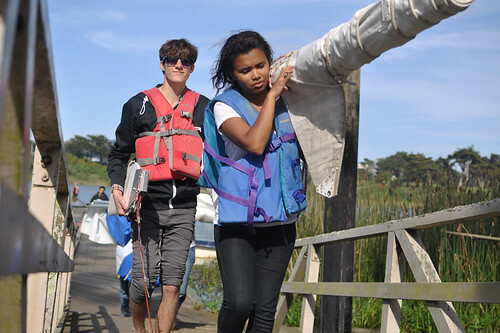 Mona Rickford, foreground, and Anthony Burt bring sailing equipment to be stored at a boathouse in Lake Merced. Professor McCreary and Kyle Day bring sailboats back to the boathouse after a full day of sailing.